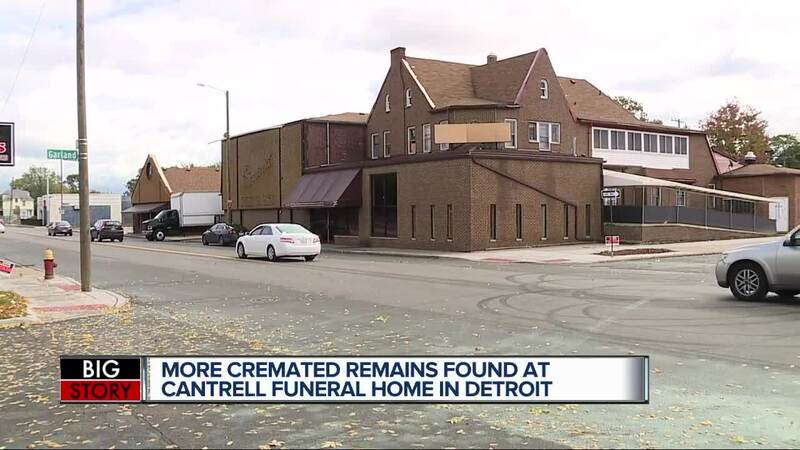 The Michigan Department of Licensing and Regulatory Affairs released a timeline of the investigation into 11 fetuses found in the ceiling of the Cantrell Funeral Home. The funeral home was shut down this past April due to several violations and "deplorable, unsanitary conditions." An anonymous letter led investigators to finding the bodies of 11 fetuses who were found in the ceiling of the former funeral home. The remains were found in boxes and two small caskets. 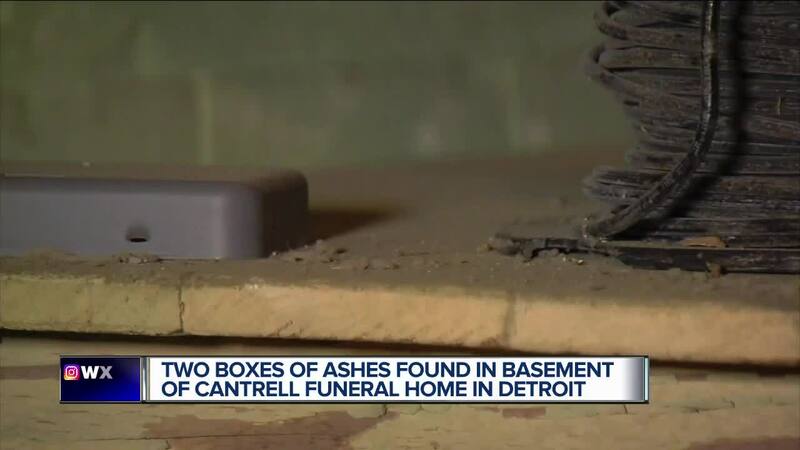 Four additional cremated remains were located inside the home, which were discovered over the past two days by a worker who was doing electrical work in the basement. The funeral home was founded by Raymond Cantrell Sr. in 1985. After his death in 2016, it was signed over to Raymond Cantrell II, who was saddled with unpaid property taxes, unpaid vendors and a funeral home in poor condition. By April 2018, state inspectors had come in and shut the funeral home down after they found "deplorable, unsanitary conditions and other violations" that included decomposing bodies and "Improper storage of embalmed bodies." Cantrell II never reopened the home and the county then foreclosed on it due to back taxes. New owner Naveed Syed was renovating the property into a community center when the bodies were discovered. Cantrell II called the discovery of the bodies "unconscionable." Detroit police are investigating to find out who is responsible for hiding and leaving the bodies of the babies. 11/20/85: Raymond Emanuel Cantrell, II obtained mortuary science LN 4501-006254, which expired due to nonrenewal on 10/31/03. 1/30/87: “Cantrell Funeral Home, Incorporated” incorporated as a domestic profit corporation in Michigan. 7/15/87: Cantrell Funeral Home, Inc. obtained its registration no. 3401-000033 under the Prepaid Funeral and Cemetery Sales Act. 9/12/96: Unknown fine amount imposed against Cantrell Funeral Home, Inc.’s Prepaid registration. 8/23/99: $1,500 fine imposed against Cantrell Funeral Home, Inc., based on statement of complaint alleging unlicensed individuals were performing embalming services. 5/10/00: Final order against Raymond Cantrell, II with $1,000 fine imposed and paid 8/8/00. Complaint alleged failure to timely embalm a body, incompetence and gross negligence. 9/7/00: Inspection of Cantrell Funeral Home performed based on statement of complaint. Found eleven bodies housed off of the preparation room, including one infant. Interviewed Raymond Cantrell, II. 10/17/01: Re-Inspection of Cantrell Funeral Home performed. 10 of 11 bodies were buried, but 11th body, a baby who died in 1997 and remained unclaimed by the family with a balance due. Funeral home would not bury the baby. Advisory letter issued regarding poor condition of preparation room. 7/3/02: Raymond Cantrell, II’s mortuary science license placed on probation, fined $6,000, and required to make restitution of $41,456.12. Fine not collected from Treasury until 1/31/17, and proof of restitution not provided until 11/17/16. License suspended until 8/1/17 per Final Order. 10/12/04: $10,000 fine imposed against Cantrell Funeral Home, Inc., based on statement of complaint alleging unlicensed activity of individuals working at establishment. Resolved by settlement. 2/16/17 to 4/25/18: Jameca Lajoyce Boone, LN 4501-006945, designated manager of Cantrell Funeral Home, Inc., until her license was summarily suspended. 9/30/17: Cantrell Funeral Home, Inc.’s registration under the Prepaid Act lapsed due to non-renewal. 11/29/17: CSCL investigators appeared on-site at the Cantrell Funeral Home to conduct a complaint-related inspection and were denied access by Raymond Cantrell, II. 12/20/17: CSCL investigator returned to the funeral home and was permitted to conduct an inspection. The paint on embalming room walls was peeling and there was large water stain on the back wall. 2/14/18: CSCL investigator re-inspected the funeral home and determined that the embalming room still had peeling and chipping paint, its floor was dirty, there were stains on the walls, and stained protective gear hung up in the room. 4/10/18: CSCL again inspected the funeral home. During this visit, investigators found two embalmed bodies in caskets in the garage of the facility. Mr. Cantrell indicated that the funeral home was delaying final disposition of the two bodies while it awaited payment in full. The bodies had been at the funeral home since November and December 2017. A third body had been in its possession from 1/9/18 through 4/17/18, because the decedent’s next-of-kin was waiting for an insurance policy to release necessary funds. The body was eventually cremated, because the released funds were not enough to pay for a burial. 4/25/18: Cantrell Funeral Home, Inc.’s mortuary science license and prepaid registration was summarily suspended along with its manager, Jameca Boone’s, mortuary science license based on incompetence and gross negligence, improperly stored bodies, poor conditions in the embalming room, and prepaid funeral contract funds not placed in escrow, constituting fraud, deceit, or dishonesty and incompetence. The funeral home was inspected and there was a discovery of more than 20 bodies awaiting final disposition. Two of the bodies were in an advanced state of decomposition and covered in mold. One of those bodies was there since February 2018 awaiting payment from an insurance policy. The second body belonged to a family member and was there since January 2018 awaiting funds being raised to conduct an autopsy. There were also 269containers of cremated remains in the basement. Of the cremated remains 52 of them were unidentifiable and four have since been retrieved by families. The remaining cremains are in the possession of Preferred Removal Services located in Flint, Michigan and are available to the next of kin. A March audit also revealed that the funeral home failed to deposit $21,574.40 received for prepaid funeral goods or services related to 13 contracts. Its Prepaid Act registration also lapsed on 9/30/17, and it failed to reassign its prepaid contracts or refund the funds to the customers. Complaint Nos. 335471, 331451, 335561, 335562, & 335762. 8/28/18: An anonymous caller reported that corpses were hidden throughout Cantrell Funeral Home, Inc.
8/29/18: Following consultation with the Department of Attorney General, CSCL inspection yielded the discovery of a stillborn corpse in a box atop a table that was not present during the April 2018 inspection together with one set cremated remains. Paperwork, including the death certificate, were located within the establishment. CSCL was able to reunite the mother of the stillborn with the remains and arrange for final disposition for the stillborn with the assistance of Mt. Olivet Cemetery in Detroit, Michigan. 10/12/18: Statement of complaint arrived via U.S. Mail to CSCL. It gave explicit instructions as to how to locate the infant corpses within the building. Mr. Naveed Syed, building owner, provided access to CSCL Bureau Director, Julia Dale, as well as the CSCL Manager of Inspections & Investigations into the vacant building at approximately 4:45PM. The building was without power. CSCL Bureau Director Dale and the Manager discovered a cardboard box and an infant sized casket in a small space located between the ceiling of the first floor and the floor the second. Both the box and the casket were hidden by insulation and the space within which they were hidden was no more than a couple of feet high. Once it was confirmed that there were remains in the box and casket, Dale contacted the Detroit Police Department. Initially patrol officers arrived on scene, followed by representatives from the DPD Homicide Task Force, the DPD Crime Scene Unit, the Wayne County Medical Examiner’s Office, the Michigan State Police and others. Over the course of the evening the bodies of 11 infants total ranging from early gestation to a couple of months old were identified. A cadaver dog swept the facility and located no additional bodies. CSCL worked with industry representatives and have secured final disposition of the infants with the Mt. Olivet Cemetery once the infants and next of kin are identified. 10/15/18: Current building owner Naveed Syed contacted CSCL Bureau Director Dale and indicated that his employees were cleaning the basement of the facility and located one container of human cremains. Arrangements were made with the Chas. Verheyden Funeral Home to take possession of the cremains. 10/16/18: CSCL Bureau Dale and her staff met with Detectives and the LT. from the Detroit Homicide Task Force to discuss the parallel Administrative and Criminal Investigations. CSCL Bureau Director advised DPD of Mr. Syed’s report of cremains. 10/16/18: Current building owner Naveed Syed contacted CSCL Bureau Director Dale and left a voice message after hours, indicating that his employees had located another container of human cremains while cleaning the facility. Arrangements were made with Chas. Verheyden Funeral to take possession of the cremains. 10/17/18: Current building owner Naveed Syed contacted CSCL Bureau Director Dale and left a voice message, indicating that his employees had located another container or two of human cremains. Verhyden Funeral Home contacted CSCL to advise that amid demolition additional cremains were found and Mr. Syed had contacted him. Arrangements were made with Chas. Verheyden Funeral to take possession of the cremains. CSCL Director while at DPS headquarters advised DPD and Wayne County Prosecutors staff of the discovery.